Let four fanged lovers open your eyes to a passion you never dared to imagine. 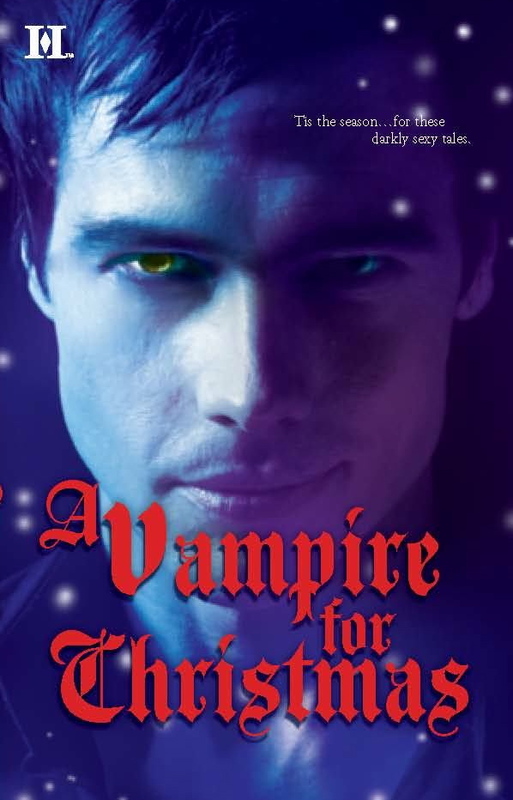 After all, there’s no place like home for the holidays–and these dazzling vampires can’t wait for an invitation. When she glanced back over her shoulder to reassure herself that it was just her crazy imagination, she almost choked. Two dark figures, less than twenty feet away, were coming straight toward her. Something dangled from one guy’s hand. A rope? Dread settled over her like a wet blanket. Ignoring the pain in her wrist, she turned and ran. She pressed the remote on her key ring. The tail lights on her car blinked, the chirp chirp a friendly hello. She’d jump in and quickly lock her doors. Should she use the button on the door handle to lock it behind her or use the remote? Remote, she decided, as she sprinted into the parking lot. A large man stepped from the shadows between two cars and jerked at the tie around his neck. Arms flailing, she slid to a halt on the loose gravel. As he stormed straight at her, a roaring, rushing sound rang loudly in her ears. Oh God, he was going to use it to tie her up. This had to be a set-up. Before she could scramble and change direction, he strode up and steadied her with a large hand. She wanted to shrink away from him, but he held her upright. With the overhead street light, much of his face was in shadow. All she could make out was the hard set of his jaw and a steely glint in his eyes as he surveyed the darkness behind her. Just as she smelled the faint evergreen scent of his cologne, the white of his dress shirt drew her attention. A hoodlum in a suit? The image didn’t make sense. She took a deep breath and realized that this man didn’t belong with those two. Without waiting for her response, he dropped his hands and was gone. Trace was good at getting people to follow orders, but for once, he wished he wasn’t. As he rounded the corner of the building and found the tan Volvo parked in the exact same spot it was twenty minutes ago, he felt a strange mix of satisfaction and anger. He flexed the fist that had just made contact with someone’s jaw. He’d easily caught up to those two parasites who’d been after Charlotte and taken care of them. They weren’t Darkbloods, but they weren’t model citizens of the city’s secret vampire population either. As soon as they realized that Trace was one of them but wasn’t carousing around for the same thing they were—a vulnerable human host—they took off. He’d hauled their asses to the ground in a nearby alley and called one of the Agency’s capture teams for a pick up. Good God, what kind of a woman would listen to a complete stranger? A sane, reasonable one would’ve gotten the hell out of Dodge the minute she climbed into the car. And the Charlotte Grant he knew was always sane and reasonable. Doubt nagged at the back of his mind. Maybe the memory wipe hadn’t been deep enough. Could she have remembered him on some level and knew that he wasn’t a threat? Impossible, he decided as he tugged at his already loosened tie and headed across the lot. He’d been thorough and very careful. Others he’d worked with over the years in the Agency may be reckless and foolhardy, but not him. As he approached Charlotte’s car, he tried not to think about how long it’d been since he’d last seen her. Tonight, she was simply a stranger that he’d helped and not someone with whom he’d once had a passionate affair. He knocked on the driver’s side window. Charlotte jumped, her eyes widening before she rolled it down halfway. Holy hell, she looked good. Twin spots of color formed on her cheeks, her skin just as smooth and touchable as he remembered. “And you always do what a stranger tells you?” Things would’ve been so much easier if she had left. He didn’t want to deal with her. He just wanted to forget her. Why on earth did I ask her to wait then? Irritated with himself, he wanted to pound on something again. Split second decisions for a vampire among humans, especially a Council member, had to be the correct ones. Slip ups and mistakes could be costly. Why did he always forget who he was and what his responsibilities were when he was around this woman? “Yeah, I get that now.” With a shaky hand, she tucked her chin-length raven hair behind an ear. “You’re way too trusting,” he growled. “Gee, thanks for the insight.” She grabbed the keys, sucking a hiss through her teeth as she tried to turn the ignition. “What’s wrong? Did they hurt you? I thought—” If he knew those two bastards had touched her, he wouldn’t have arranged for a pick up. He’d have staked them and watched their bodies turn to ash. No, she wasn’t. “Let me see your hand.” He opened the door and leaned in. Damn. He was being too forward with her, forgetting that he needed to act as if she were a stranger to him. To make himself less intimidating, he knelt so that he had to look up at her face. The faintly vanilla scent of her skin filled his nostrils, bringing back all sorts of memories. Talking. Laughing. Long walks through the city. Burying his nose in her hair as he made love to her. He ground his teeth together and forced those thoughts from his head. Relationships with humans were frowned upon, especially for a Council person who was supposed to set an example for others to follow. Although matings between vampires didn’t always produce offspring, those with a human never would. Maintaining their population numbers, especially given that they were so low, had always been one of their prime objectives. His relationship with Charlotte last year had progressed quickly. What he’d intended to be just an indulgence turned out to be so much more. Although she didn’t know the truth about him, he had begun having real feelings for her. Then came that horrible business with his cousin and the ultimatum from his father. It was the catalyst that had forced him to do the right thing…and stay out of her life. Over and over he told himself it was a blessing in disguise when he had to wipe her memory. She could never know the truth about him and he could never tell. Not only did she deserve much more than a relationship built on lies, but if he wanted the Council to vote him in, things between them had to end. “I told you, I’m fine. I don’t need your help. You can leave now.” Her voice was strained and she still looked frightened from her ordeal. He’d been too short with her. She hesitated, but still didn’t give him her hand. “Those two were bad news and you should’ve just left.” He ran a finger inside his suddenly too tight collar. Touched by her concern, he resisted the urge to reach out to her, run a finger along her jaw. Nothing had changed about her. She was still more concerned for someone else’s well-being than her own. Hell, if he’d have thought things through, he’d have known she wouldn’t have left without knowing what had happened to him. He’d count to three, he told himself, and if she still refused his help, he’d leave. She held out her hand and he took it before he said three. The instant he touched her, a jolt of electricity shot up his arm and she gave a gasp of surprise. Just as quickly, he put up a mental barrier to stop the transfer. Damn. He’d forgotten how easily her energies transferred to him. Or how easily his body accepted them. Most humans couldn’t feel when a vampire was absorbing their energies like this, they’d simply be more lethargic than normal. But Charlotte sure did.